The Nashville Predators hung on for dear life in the closing minute of their game with the Colorado Avalanche at the Pepsi Center on Thursday night and were thrilled to death to get out of town with a 3-2 victory. Had there been a few more seconds in the game, the outcome could have been totally different as the Predators were gassed and the Avs were fighting hard in the final moments. It was a classic rope-a-dope by the Avalanche who lulled everyone asleep for fifty-three minutes and then caught on fire for the final portion of the contest. As the clock ticked down, the Avalanche dominated play and kept the puck in the Predators end. The Avs hit pay dirt twice at the end of the game and just fell short of a tying goal as time expired. The Predators received goals from Colin Wilson, Jordin Tootoo, and Marty Erat, while Paul Stastny and John-Michael Lyles tallied for Colorado. Pekka Rinne was the difference maker in the game as he stopped 27 of 29 Colorado shots including a barrage in the third period. Brian Elliot had a decent night, stopping all but three of the 34 Predator shots that he faced. The Predators and Avs skated end to end as the game opened and actually played fairly evenly until Matt Halischuk found Wilson skating through the slot and sent a pass from behind the net that Wilson flipped past Elliott to give the Preds a 1-0 lead at 15:35. The Predators out shot the Avalanche 12-9 and led the Corsi 21-19 in the first period. The second period was a hard one to watch. Neither team appeared to be playing inspired hockey. The Predators were playing good "road game" hockey, containing the Avalanche and not giving them many chances. The Preds got on the board at 10:20 when Marty Erat sent a pass from the corner to Cody Franson at the blue line who then fired it at the net and Tootoo made a perfect redirect to make it 2-0 Preds. For the period, the Preds out shot Colorado 18-5 and led the Corsi 25-11. The Predators had back to back power play opportunities but did not convert on three shots. The intensity level picked up for both teams in the second half of the final period. After a roughing penalty on Cody McLeod, Erat was able to shake loose from a Avs defender and go in and beat Elliott one on one to give the Preds a 3-0 lead at 12:52 which seemed like "game, set, match. Before the Preds were able to celebrate, 43 seconds later, Stastny was battling with Joel Ward in front of the Preds' net and took a pass from Milan Hejduk and slipped it past Rinne to end the shut out possibility. The Avalanche continued to keep the puck in the Predators zone and kept heavy pressure on Rinne and scored again on the goalie pull at 18:58 during a major poke-fest on Rinne by three Avs players around the net. Lyles was credited with the goal. The game was still up in the air down to the last second when Hejduk put a shot on Rinne with less than a second left. The final icing on the cake was David Legwand and Erik Johnson taking coincidental roughing penalties for a scrum behind the net after the game ended. In the final period, the Avalanche dominated the Predators, outshooting them 14-4 and leading the Corsi by an astounding 29-7 margin. Coming out of the game, injuries may be a concern as Erat was struck by a Shea Weber slapshot and had to miss a couple of shifts in the second period. More problematic was Jordin Tootoo leaving the game with an "upper body" injury after a collision with John-Michael Lyles with 3:01 left in the second period. Joel Ward and Patric Hornqvist were also shaken up in the final period but were able to return. The win gave Nashville 94 points and moved them back ahead of Anaheim into sixth place in the Western Conference. The Predators left immediately after the game and will play Detroit at the Bridgestone Arena in a special 2 p.m. start time on Saturday. Practice is scheduled for Friday at Centennial Sportsplex but it would not be surprising to see it canceled or become an off ice work out or optional skate. Tickets just went on sale for this year's NHL Awards show that is returning to the Palms Hotel in Las Vegas for the third consecutive year. Go here to pick up your tickets now. NEW YORK (March 31, 2011) – The stars of the National Hockey League will come together with celebrities from music, stage and screen for a celebration of hockey at the star-studded 2011 NHL® Awards on Wednesday, June 22, at the Pearl Concert Theater inside the Palms Hotel in Las Vegas. It will be the third straight year the NHL has feted the best hockey players in the world at The Palms Hotel in Las Vegas. The 2011 NHL Awards will be broadcast by VERSUS in the United States and CBC in Canada. Tickets to the 2011 NHL Awards go on sale to the public today, Thursday, March 31, at Noon PT / 3 p.m. ET, via Ticketmaster.com at nhl.com/awardstickets and at the Pearl Concert Theater Box Office. Tickets include access to the 2011 NHL Awards show and the official NHL Awards Party, a cocktail reception to be held immediately following the show. Guests must be 21 or older to attend the NHL Awards Party. Individual honors to be presented at the 2011 NHL Awards include: Art Ross Trophy (top scorer for the regular season), Bill Masterton Memorial Trophy (perseverance, sportsmanship and dedication to hockey), Calder Memorial Trophy (outstanding rookie), Frank J. Selke Trophy (outstanding defensive forward), Hart Memorial Trophy (most valuable player to his team), Jack Adams Award (outstanding coach), James Norris Memorial Trophy (outstanding all-around defenseman), King Clancy Memorial Trophy presented by U.S. Army (leadership and humanitarian contribution to his community), Lady Byng Memorial Trophy (sportsmanship and gentlemanly conduct), Mark Messier NHL Leadership Award Presented by Bridgestone (superior leader in hockey and a contributing member of society), Maurice “Rocket” Richard Trophy (top goal-scorer for the regular season), the NHL Foundation Player Award (charitable and community work), Williams M. Jennings Trophy (goaltender(s) on team with fewest goals-against), the NHL Lifetime Achievement Award, and Vezina Trophy (outstanding goaltender). The Ted Lindsay Award, formerly known as the Lester B. Pearson Award, which is presented annually to the “most outstanding player” in the NHL as voted by fellow members of the National Hockey League Players' Association, will also be awarded. With just eleven days remaining in the NHL regular season, the races for the Maurice “Rocket” Richard and Art Ross Trophies are coming down to the wire. In the race for the Rocket, Corey Perry of the Anaheim Ducks has vaulted into the lead with 46 goals. In his past eleven contests, Perry has scored 15 goals; a span that includes six multiple-goal games, four game-winning goals and two overtime goals. Right behind in second place with 44 goals is Steven Stamkos of the Tampa Bay Lightning, who is looking to repeat as the leading goal scorer in the NHL after sharing that honor in 2010 with Pittsburgh’s Sidney Crosby. For the Art Ross Trophy, Daniel Sedin of the Vancouver Canucks leads the pack with 98 points, seven ahead of Tampa Bay’s Martin St. Louis with 91. Sedin is trying to keep the trophy in the family as his brother, Henrik, who currently sits tied for second place with 91 points, won the award in 2010. Perry, with 89 points, and Stamkos with 88 round out the top five competitors. Nominees for each Award will be announced in the coming weeks, along with a full line up of celebrity guests, presenters and entertainment. For more information, visit www.nhl.com/awards. Official 2011 NHL Awards travel packages, including reserved tickets, accommodations at The Palms Hotel, souvenir gifts and more, are available via Global Event Forum, the Official NHL Events Fan Package Partner, at nhl.com/fanpackages. For a chance to join the party in Las Vegas, fans can also visit www.vegas.nhl.com to enter to win a trip for two to the 2011 NHL Awards, including round trip airfare for two, two night’s hotel accommodations in Las Vegas and two tickets to the 2011 NHL Awards and official NHL Awards Party. Fans must be 21 or older to enter the contest. Visit www.vegas.nhl.com for complete contest rules. Predator prospect Jeff Foss and free-agent Chris Cahill have signed Amateur Tryout Contracts with the Milwaukee Admirals as announced by the AHL club today. It's probably starting to get crowded in the practice dressing room with these two guys, Atte Engren last week, and the Austin Watson signing yesterday. Here is a post from yesterday on Foss from the local paper in Albany. Here is Cahill's profile from Yale. Milwaukee, WI-- The Milwaukee Admirals announced today the signing of defensemen Jeff Foss and forward Chris Cahill to an amateur tryout contracts (ATO). Jeff Foss, a sixth round draft pick by the Nashville Predators (166th overall) in the 2008 NHL Entry Draft, has played the last four seasons for Rensselaer Polytechnic Institute (RPI) recording 14 points (3g,11a) and accumulating 48 penalty minutes during the 2010-11 campaign. He finished his four year career with 38 points (8g, 30a) in 154 games. Prior to playing at RPI, the Moorhead, MN native spent one season with the Sioux Falls Stampede of the USHL. Cahill finished up his collegiate career at Yale University posting 75 points (31g, 44a) in 126 games. This season, he recorded 34 points (15g, 19a) and spent the most time in the penalty box with 64 penalty minutes in 35 games. The North Andover, MA native also played for the U.S. National Under-18 Team from 2003 to 2005 and he has seen time on ice with current Admiral Ryan Flynn and recalled Admiral Blake Geoffrion. Fans can purchase tickets by calling Ticketmaster at (800) 745-3000 or logging on to milwaukeeadmirals.com. Group discounts are available starting with just ten people and get a minimum of $2 off the face value. For more information or to purchase group tickets fans can call the Admirals office at (414) 227-0550 or visit milwaukeeadmirals.com. Don’t forget to follow the Admirals on Twitter (@mkeadmirals) and on Facebook! Tuomo Ruutu checked Hall Gill into the boards which shattered the glass beside the Hurricanes bench. The breakage occured with 18:07 left in the third period of Carolina's 6-2 win over Montreal at the RBC Center in Raleigh. In Calgary, fans were crushed when a goal was disallowed with 5:10 left in the second period and Anaheim leading 2-1. The call on the ice was no goal and the review was "inconclusive". Anaheim went on to win the game 4-2 but with the Flames hopes of a playoff seed on the line, this could have been a turning point in the game. Today's every goal from every game is dominated by the St. Louis Blues who blistered Detroit 10-3 at Joe Louis Arena. It was the first time in 17 years that the Wings had allowed double digit goals to an opponent. Surprisingly, Chris Porter was the only multi-goal scorer in the contest. The other surprising game from last night was Carolina romping over Montreal 6-2 to keep their playoff hopes alive. The Habs had won all three games with the Canes this year so Carolina finally got revenge. Jeff Skinner and Jamie McBain each had two goals for the Hurricanes. Anaheim moved past the Predators into sixth place with a 4-2 win over Calgary which probably snuffed out the Flames dim playoff hopes. 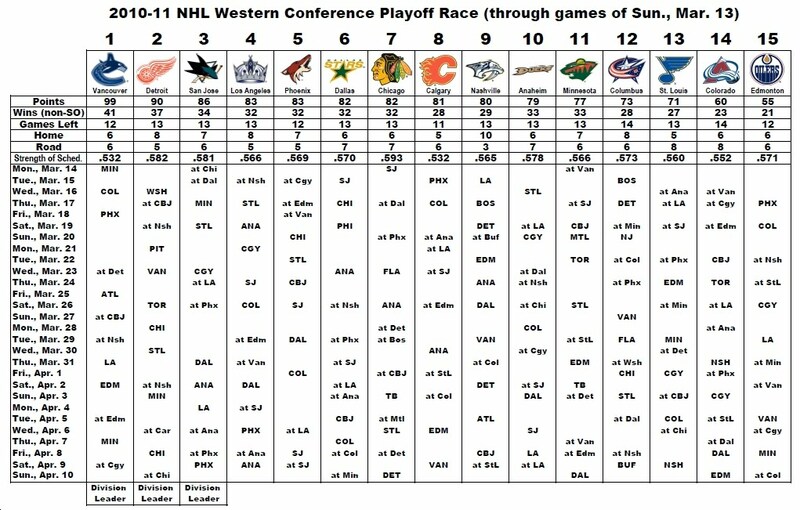 If Calgary wins their four remaining games they would get to 95 points which probably will not be enough to make the playoffs in the West. Cory Perry had two goals and Ray Emery got the win in net as Jonas Hiller's vertigo appears to be continuing. Buffalo shut out the Rangers 1-0 behind the perfect goaltending of rookie Jhonas Enroth who stopped all 23 Ranger shots as he beat his childhood idol Henrik Lundqvist. With the win, Buffalo stated three points ahead of Carolina and moved past the Rangers into seventh place. In a game of little consequence, New Jersey beat the Islanders 3-2 on Andy Green's first goal in three months. Frans Nielsen had both goals for the Islanders. 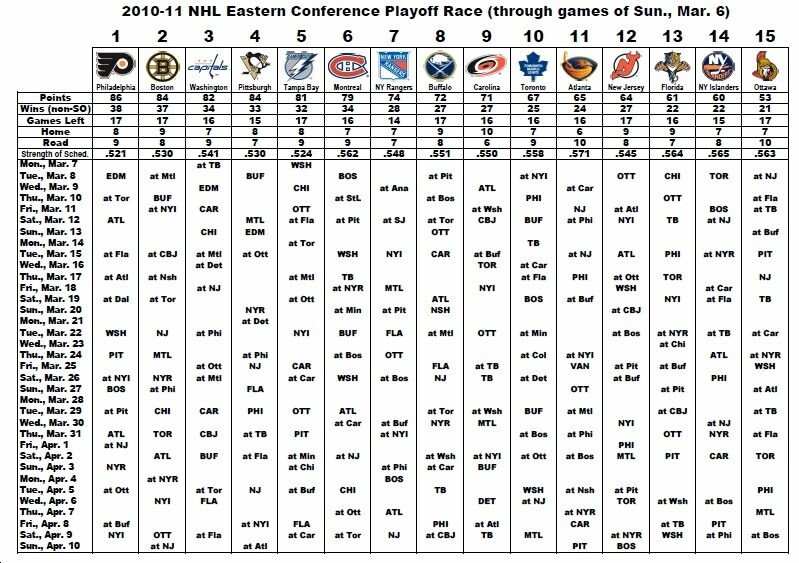 Toronto at Boston (6:00 CDT) The Leafs appear to have run out of games and would need a near miracle to get back in it while Boston hopes to pick up a little momentum as they prepare for the playoffs. New York Rangers at New York Islanders (6:00) The Rangers desperately need to win to keep Carolina at bay while the Isles would love to derail their playoff run. Atlanta at Philadelphia (6:00) The Flyers could mathematically eliminate the Thrashers with a win. Columbus at Washington (6:00) This should be an easy one for the Caps. Pittsburgh at Tampa Bay (6:30) The Lightning are trying to turn their recent mediocre play around and will have a challenge in doing so against the Pens who will have Sidney Crosby in tow for moral support. Ottawa at Florida (6:30) There's little to say about this one. Edmonton at Minnesota (7:00) Probably less to be said here. Nashville at Colorado (8:00) Nashville hopes to avoid tripping up against the Avs in a game they can't afford to lose after falling to seventh last night when they were idle. Los Angeles at Vancouver (9:00) This is a much bigger game for the Kings as they try to hang on to with without their top two scorers. Vancouver could wrap up the President's trophy with a win and a Flyer loss. Dallas at San Jose (9:30) Another critical game for Dallas who is still three points out of the top eight. This is the middle game in a five game road trip where they have only gathered a point in the first two games. The Nashville Predators are in Colorado tonight to play the Avalanche in a game that goes beyond being a "must win" situation. The Preds are in a dogfight in the Western Conference for a playoff spot and postseason positioning and cannot afford a loss. The Predators are coming off a 3-1 loss to Vancouver on Tuesday that broke their six game winning streak. For the first half of the season, all of their regulation losses came in streaks as did their wins. Fans are hoping that the loss was an anomaly and that the team can bounce back in a game that on paper that they should clearly win. This is the final meeting of the year between the two teams. The Predators have won all three games so far with the most recent being on March 12 in Nashville which was a 4-2 win. A month earlier, there was a circus type atmosphere leading up to the game in Nashville on February 12 which was the Predator debut of Mike Fisher and what would end up being Peter Forsberg's final NHL game. The Preds won that game 5-3 in a big comeback. Their other meeting was in Colorado on January 20 when the Preds won 5-1 and were flying high during one of their better stretches of the season. This meeting is totally different. The Avalanche have won only three times since January 24 and have looked horrible in most games. They basically have nothing to lose. The Predators fell to seventh place last night when Anaheim virtually eliminated Calgary in a 4-2 win and slipped past the Preds. Barry Trotz was asked how to prepare for the Colorado game after playing the best team in the league. "Show up and play, play hard. How do you do it? You come committed, knowing that you have to have a lot of determination and urgency." "Colorado is a dangerous team. They've played us tough all year. They've got lots of speed. They've got lots of skill. Duchene is on fire right now and they are at home. They are going to be very determined to put a wrench into our plans." Pekka Rinne (30-21-8, 2.10, .929) will be in net for the Predators while it is anyone's guess who will start for the Avalanche. Either Peter Budaj (13-18-4, 3.29, .891) or Brian Elliott (15-25-9, 3.33, .893) could get the start for Colorado. Update: Looks like it is Elliott tonight vs. the Predators according to @TheGoalieGuild: Brian Elliott the first goalie off for Colorado. After the game, the Predators will return home and prepare for the game with Detroit on Saturday that has a special 2 p.m. start. Other previews come from Amanda Dipaolo, Robby Stanley, Predatorial, Marc Torrence, The Tennessean, Fang Faction, and Predators.com. For previews from Denver check out Adrian Dater, Aaron Musick, Mile High Hockey, The Avalanche Guild, Jibblescribbits, and AvsHockeyPodcast. David Poile will be on the NHL Hour with Gary Bettman today at 5 p.m. on XM NHL Home Ice and the NHL.com. David Boclair has interesting numbers on the Predators regulation wins. Brian Mullen has an update on Steve Sullivan and Cal O'Reilly and neither are close to a return. He also has a feature on Joel Ward and a few notes. Paul McCann has a valid rant about the Tennessean's editorial bias against the Predators. Robby at HNIN calls for the Preds to end their streaky tend this year. Pierre LeBrun places Pekka Rinne second in the Vezina race behind Tim Thomas. Ryan Ellis is called one of the most highly decorated junior hockey players of the decade at Hockey's Future. J.R. Lind guests at On the Forecheck with a hockey related real estate post. In what some might consider an upset, Pekka Rinne won the OTF March Madness competition which clearly marks him as the Preds MVP (and Hart candidate). The Milwaukee Admirals clinched a playoff berth with a 3-2 win over San Antonio last night. Rob Rossi broke the news that Sidney Crosby will travel to Florida today after a day off ans has been cleared to practice with the team. Craig Custance says that Crosby may still not see the ice this season. Ryan Miller is injured with an "upper body injury" and did not play last night in the Sabres 1-0 win over the Rangers. In a couple of surprise games last night, the Blues annihilated Detroit 10-3, and a desparate Carolina team beat Montreal 6-2 to keep their playoff hopes alive. Down goes Brown may have the best look at the Awards voting that I've seen. Tuesday night marked the final game for Oilers broadcast legend Rod Phillips. TSN dropped the ball by not showing the pre-game ceremony where the 3542 game banner was raised to the rafters. I heard an interview with Phillips and when he was hired he had never done a hockey play-by-play before. RLD Hockey does a reset with the Olympic point system. Toronto fans would like it. Best wishes in recovery to Manny Malhotra after successful eye surgery. As much as I would like to see Barry Trotz win the Jack Adams, if I had a vote, Dan Bylsma would get it at this point. Here is an Adam Kimelman piece on how he has cobbled together the season with injuries and distractions. NASA's Messenger satellite is orbiting Mercury and is sending back high quality photos. It's hard to believe that this is a first. Here is more detail about the mission that began in 2004. Ryan Kennedy of The Hockey News tweeted earlier that the Nashville Predators signed Austin Watson to an entry level contract today. It has now been confirmed by the Predators. Watson's season with the Peterborough Petes concluded last week. After a slow start, he rallied to have 34 goals and 34 assists for a perfect point a game average in 68 games. According to David Poile, Watson will spend the balance of this season on an amateur tryout agreement in Milwaukee. Here is a video of Watson from the Draft in Los Angeles last June, moments after his name was called. Here is what David Poile had to say about drafting Watson in the opening round. Nashville, Tenn. (March 30, 2011) – Nashville Predators President of Hockey Operations/General Manager David Poile announced today that the club has signed 2010 first-round pick (18th overall) Austin Watson to a three-year entry level contract. Watson spend the duration of the 2010-11 season with Milwaukee (AHL) on an Amateur Tryout Agreement. "The second half of the season he really played well," Poile said of Watson. "He played in all situations and produced in all situations. Not only was he a strong defensive forward killing penalties and blocking shots – things we liked in his draft year – but he produced some very good numbers offensively. All-in-all, it was really good progress for his year for Austin." Watson, 19 (1/13/92), completed his third Ontario Hockey League season in 2010-11, posting 68 points (34g-34a) in 68 games with the Peterborough Petes. The Ann Arbor, Mich., native tied for 12th in the OHL in power-play goals (14), tied for the club lead in goals, and ranked second on the Petes in points. In 2009-10, the 6-4, 193-pound was Peterborough’s nominee for the 2010 Red Tilson Award as the OHL’s Most Valuable Player after amassing 20 points (9g-11a) in 10 games upon being acquired from Windsor. With the Windsor Spitfires as a rookie in 2008-09, Watson won both the Robertson Cup as OHL Champion and Memorial Cup. The oldest of 10 children, Watson has participated in the past two USA Hockey National Junior Evaluation Camps, and in 2010, helped the United States win gold at the U-18 World Championships, posting three points (1g-2a) and 33 penalty minutes in seven games. Jay Levin adds additional commentary at Predators.com. When you add each teams power play percentage to their penalty kill percentage, you get an idea of a team's overall effectiveness in odd man situations. The league average for power plays is 17.9% and for penalty kill is 82.1%. The two together come to 100% which would be the gauge for whether a team is above or below average compared to others in the league. Sixteen teams are above the 100% level. In general, you would think the top teams would be the most effective in special team play but that is not necessarily true. Teams that are in the top half of the ranking that are not currently in the top eight of their conferences include Minnesota (8th-102.4), Ottawa (14th, 100.9), and Calgary (15th, 100.5). More surprising are the teams that are in the bottom half that are considered to be stronger teams. That list includes Phoenix (28th, 94.3), Nashville (18th, 99.3), and Boston (17th, 99.6). The true anomalies on the list are Phoenix and Minnesota. The Coyotes are fairly average on the power play (22nd, 16.2%) and near the bottom on the PK (26th, 78.1) but are still in fourth place in the competitive Western Conference. Minnesota attains its ranking by being in the top ten in both categories: power play (9th, 18.9) and penalty kill (10th, 83.5). Based on this you would expect the Wild to be better than their eleventh place, ten points out of the playoffs position. 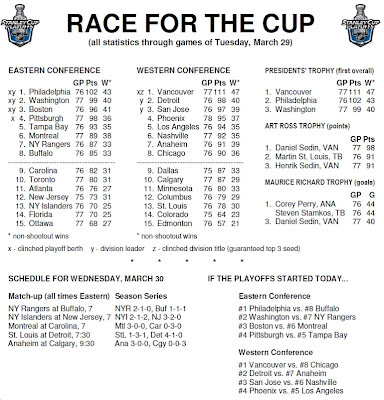 Here is today's updated version of Race for the Cup from NHL Media Services. 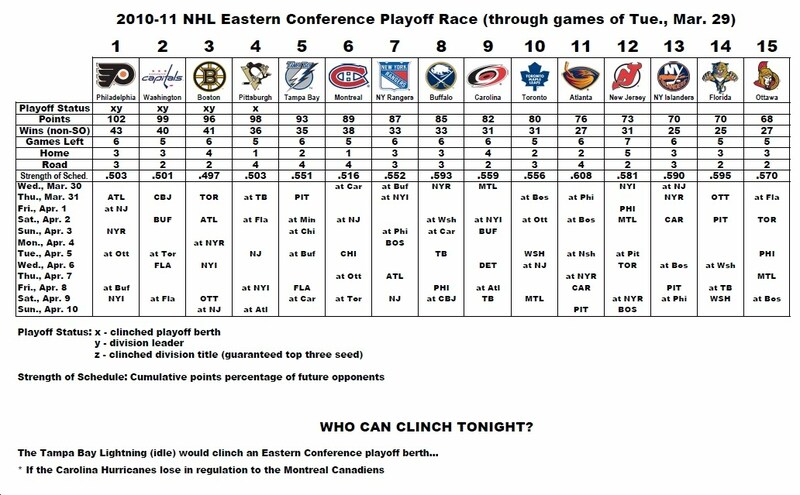 We now have seven of the sixteen playoff berths secured with a chance of an eighth in Tampa Bay if Carolina loses in regulation to Montreal tonight. Vancouver did clinch the Western Conference title last night and are three points away from winning the President's Trophy. Click on the images below for a larger, readable/printable copy. There were several big games on Tuesday night. None was bigger than the showdown in the desert between Dallas and Phoenix. As in most vital Western Conference games, it went to overtime and eventually to a skills competition with the Yotes winning 2-1 on Ray Whitney's shoot out goal. In picking up a point, Dallas is still in ninth place on the outside looking in with three tough road games ahead. Vancouver clinched the Western Conference title with a near perfect 3-1 win over Nashville with Alex Burrows picking up the first two goals. Chicago played the seconds half of their Versus back to backs and lost to Boston 3-0 in another Tim Thomas shut out as he continues to try to claim the Vezina trophy. Los Angeles played their first post Anze Kopitar injury game in Edmonton and Captain Dustin Brown got both goals in a 2-0 win in Edmonton. The Kings maintained their fifth place position and put two points between them and sixth place Nashville. Toronto kept their slim playoff hopes alive by beating Buffalo 4-3 to stay withing five points with five games remaining. 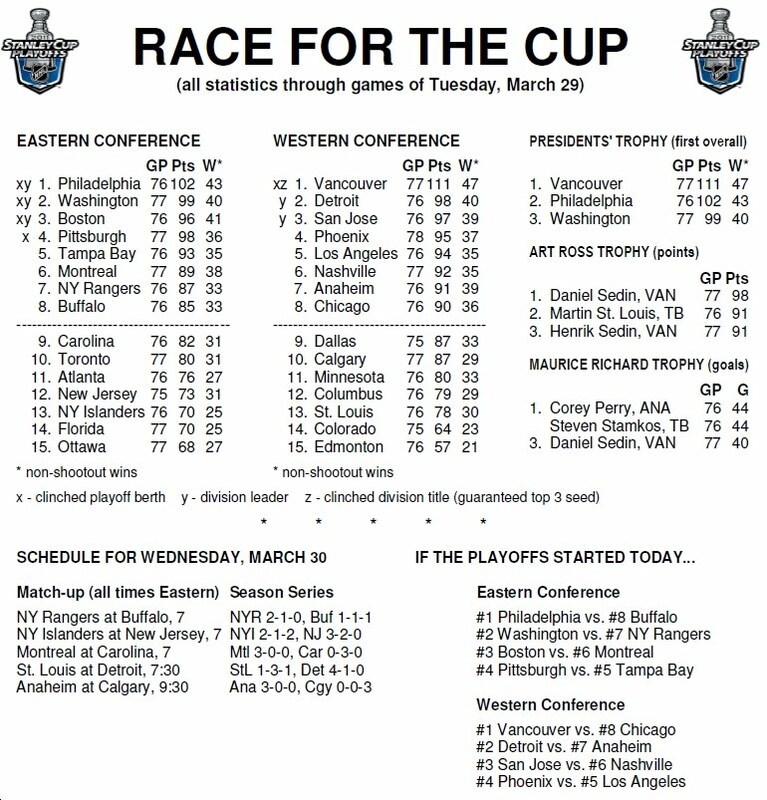 Likewise, Carolina hung with Washington and forced a shoot out where they won 3-2 to pull within three points of Buffalo for the eighth and final playoff spot in the East. Tampa Bay got two goals each from Martin St. Louis and Dominic Moore as the Lightning handled Ottawa 5-2 and maintained their fifth seed in the East. Montreal scored for the first time in four games in beating Atlanta 3-1 as they scored two goals eleven seconds apart in the first period to avoid breaking a team record of being shut out four consecutive games. Philadelphia stretched their margin over Pittsburgh to four points by easily handling the Pens in a 5-2 victory at the Consol Center. Ville Leino had two goals and an assist to lead the Flyers. In games of little consequence, Columbus beat Florida 3-2 in a shootout in front of 11,670 fans when tickets were going for five dollars. Minnesota ended their eight game losing streak by beating St. Louis 3-2 in another shoot out. New York Rangers at Buffalo (6:00 CDT) It is a battle for seventh in the East in a potential match between Henrik Lundqvist and Ryan Miller. New York Islander at New Jersey (6:00) On the other end of the spectrum, it is a match for draft positioning in this cross town rivalry. Montreal at Carolina (6:00) The Hurricanes are looking to close the gap on Buffalo and could pull withing a point of eight place with a win and a Sabre loss. St. Louis at Detroit (6:30) The Wings hope to solidify they second place seed and division lead with a win over a division rival in a game that they should win. Anaheim at Calgary (8:30) This is an absolute must win game for the Flames who will only have four more games after tonight and can only get to 97 points if they win out which may not be enough to make the playoffs in the Western Conference. There is little doubt after watching the Vancouver Canucks take care of business on the way to their ninth road win in a row, that they are the best team in the NHL at this point and time. With the 3-1 win over the Predators, they cliched the top spot in the Western Conference and home ice advantage through the conference finals. They had already locked up the division title and are now three points away from winning the President's Trophy. The Predators had a nice run, winning six in a row and the players and coaches are ready to move on to the next game in Colorado for a shot at additional points. Pekka Rinne was outstanding once again in net and was the only reason that the Predators remained in the game as Vancouver out shot the Preds 32-17. He made numerous highlight reel type saves and was the primary penalty killer on five Vancouver man-advantages. Although he did not show up on the scorecard, Patric Hornqvist had an excellent game. Jordin Tootoo's five shots in 9:02 of ice time was a team high. After the dust settled at the end of the evening, Nashville remained in sixth place in the Western Conference with 92 points. Phoenix is still in fourth (95) and LA is in fifth (94) as each team won their games. Here is our game story from last night with post game video. Jim Diamond touches on the Predators power outage. From the blog world reports come from Ryan Porth, Amanda DiPaolo, Mark Willoughby, Chris Burton, Jeremy Gover, Predatorial, Fang Faction, and Hockey Night in Nashville. The other side of the story from Vancouver can be found at The Province, Vancouver Sun, Nucks Misconduct, Kurtenblog, The Canucks Way, and Canucks Hockey Blog. 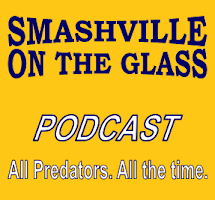 Audio clips from the Predators include John Blum, Mike Fisher, Pekka Rinne and, Shea Weber. Clips from Vancouver include Coach Alain Vigneault, Alex Burrows, and Roberto Luongo. Yesterday's RLD Hockey Radio featured an exclusive interview with Shane O'Brien and a live visit with Dan Rosen of NHL.com. We covered plenty of ground in an episode that is well worth a listen. You can use the following player to listen to the podcast or download at the RLD Radio site. PredsOnTheGlass was nominated as a "Stylish Blogger" by our friend Michael Langlois at his "Taking You Beyond the Game" website. Thanks again, Michael, for your recommendation. AJ has an informative two part post (part one, part two) about the Predators Peaking on Schedule where he takes a look at a wide range of factors including how the schedule is worked out each year. Dirk jumps on the Pekka for Hart bandwagon in this pre-game piece from yesterday. Steve Sullivan makes Puck Daddy's list of players he would like to see win a Stanley Cup. Ryan Suter and Blake Geoffrion's roots can be traced back to prepping at the Culver Academy. Jimi Russell has a feature. Predator defensive prospect Roman Josi is now on Twitter at @rjosi90. Predators.com has the weekly Admirals Update. The Milwaukee Admirals made history with their 40th win and 90th point which made it eight years in a row for the team. Gabriel Bourque is also coming on strong in the seasons second half. It's still not to late to attend the Predators Foundation Wine Tasting Event on Friday night to benefit local charities. Go here for details. The Pens are having a late surge pushing Marc-Andre Fleury for the Vezina Trophy as well as the Hart. Kevin Allen says forty is just a number and has the proof to go with it. Adrian Dater puts the Avalanche collapse in historical perspective. T.J. Oshie's issues appear to be larger than missing a practice. 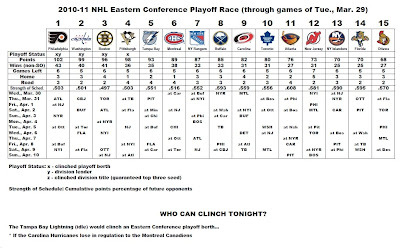 Patrick Hoffman looks at whether Boston will go further this playoff season. Elliotte Friedman's thirty thoughts includes a new award and a bunch of Red Wings stuff. Nordiques Nation is sending 2000 folks to the season ending Bruins game at New Jersey to again demonstrate their interest in an NHL team for their new, yet to be constructed arena. Canada is in the midst of an election campaign and Dahlia Kurtz explains how to get her vote. Alexandre Burrows scored two goals and that was all the Vancouver Canucks needed for a 3-1 victory to clinch the top seed in the Western Conference and end the Predators six game winning streak. Roberto Luongo out-dueled Pekka Rinne in a match-up of potential Vezina finalists. Rinne held the season edge giving up only five goals to Vancouver to the seven allowed by Luonga. For the game, Luongo stopped 16 of 17 Predator shots while Rinne gave up two goals on 31 shots faced. The final shot was an empty netter. Mike Fisher scored the lone Preds goal to keep his meager two game goal streak alive. The opening period was played close to the vest with tight defense at both ends and neither team taking any chances. The Preds out shot the Canucks 10-7 while the Corsi was tied at 14. The second period was more of the same with the both teams taking a pair of penalties but neither squad was able to capitalize on the man-advantage. The Predators finally got on the scoreboard at 14:01 in the second period when Fisher was perfectly positioned in the left face off circle for a big rebound off a Jon Blum shot. Luongo was prone on the ice and Fisher easily lifted it into top of the net to put the Preds ahead 1-0. For the second period, Vancouver out shot Nashville 11-5 and led the Corsi 17-9. The Canucks jumped on the board quickly in the third period at 1:17 when Henrik Sedin centered a perfect pass from behind the net to Burrows who was situated on the right edge of the blue goal arc and slipped it past Rinne to make it 1-1. After a rousing TV time-out ovation with 2:59 remaining in the contest, the Canucks killed the enthusiasm when they picked up a loose puck in their own zone and sent it through both Sedins to Burrows who had broken free and went in on Rinne and beat him on the breakaway for a 2-1 lead and the eventual game winning goal. Trotz described the fatal blow, "It was a little bit of a scrum in the corner and they popped it out. Sedin threw it right up the middle and Burrows just cracked the seam and took off. He blew the zone and we got a little flat footed while he got it in full flight and he walked right in." The empty netter by Aaron Rome with nine seconds left was the icing on the cake for the Canucks. In the final period, the Canucks out shot the Predators 14-2 as the Preds had few offensive chances to recover once Vancouver got the momentum when they tied the game. Trotz summed it up well, "In the third period, we were defensive minded because they were on offense. We just turned too many pucks over in the third." "We just didn't have enough of that 'bite' in our game, that determination, that urgency, you could use a multitude of words." Trotz continued, "You've got to take care of business. If we get to within three minutes of a point, we got to make sure we get that point. Worry about the second point after that. That's the biggest disappointment. You play 57 minutes of the game and you don't get a point." Shea Weber was ready to look forward to the next game, "It's tough, Those were some big points, but there's nothing we can do now. We played forty good minutes and we have to move forward,"
The Predators will practice on Wednesday and then head to Colorado for Thursday night's match with the Avalanche at the Pepsi Center. In a article at The Nashville Post, it was revealed that communication giant, ATT would announce a new agreement at an afternoon press conference where they will become the official wireless provider for the Nashville Predators and the Bridgestone Arena. ATT will also announce other upgrades to it's network in Nashville at the same time. Nashville Tenn. (March 29, 2011) – The Nashville Predators and AT&T today announced a partnership that names AT&T the official wireless provider of the Nashville Predators and Bridgestone Arena. Building on its strong 2010 record of network accomplishments AT&T has also announced network improvement plans designed to enable 4G speeds and enhanced reliability to Nashville and surrounding communities in 2011, including installing a distributed antenna system (DAS) in Bridgestone Arena, home of the Nashville Predators. AT&T has invested more than $550 million in its Nashville and surrounding communities wireless and wireline network from 2008 through 2010 as part of its commitment to superior service in the area. Through this partnership, AT&T will serve as the exclusive wireless provider of the Nashville Predators and Bridgestone Arena, and additionally, AT&T has enhanced the amount of wireless voice and data traffic that the network is able to handle at large capacity gatherings, such as NHL and NCAA games, where demand on the network is at its peak. The investments made in the Nashville area wireless and wireline network are part of the nearly $1.2 billion AT&T invested from 2008-2010 across Tennessee. There were only two games in the NHL last night and both had Western Conference playoff implications. Tonight's eleven games will more than make up for last night's dearth of games. The big match on Monday was the first of three remaining meetings between Chicago and Detroit where the Hawks won 3-2 in overtime on Marion Hossa's goal 51 seconds into the extra period. Going in to the game, all eyes were on Wings goalie Joey MacDonald who was filling in for the injured Jimmy Howard. MacDonald played well enough to win on most nights as he was peppered with 41 shots. Forty year old Teemu Selanne continued his amazing recent run with a hat trick and two assists against the Avalanche in the Ducks 5-4 win in Anaheim. The Ducks held a 2-0 lead at the end of the opening period but did not have staying power to compete with the Ducks who have been playing like a team on a mission. Corey Perry did not make the scorecard after his second star of the week honors. Buffalo at Toronto (6:00 CDT) Toronto would be withing a point of mathematical elimination with a regulation loss tonight. Philadelphia at Pittsburgh (6:00) The Pens could tie the Flyers with 100 points with a regulation win but Philadelphia would still have a game in hand. Carolina at Washington (6:00) This is a must win for the Canes who are five points out of eight place with seven games to go. The Caps could get to 100 points with a win. Florida at Columbus (6:00) Scott Arniel can't decide who to punish by making them play, the vets or the rookies. Chicago at Boston (6:30 Versus) This is a big one as Chicago is coming off last night's win still trying to secure a playoff position and possible first round home ice advantage. 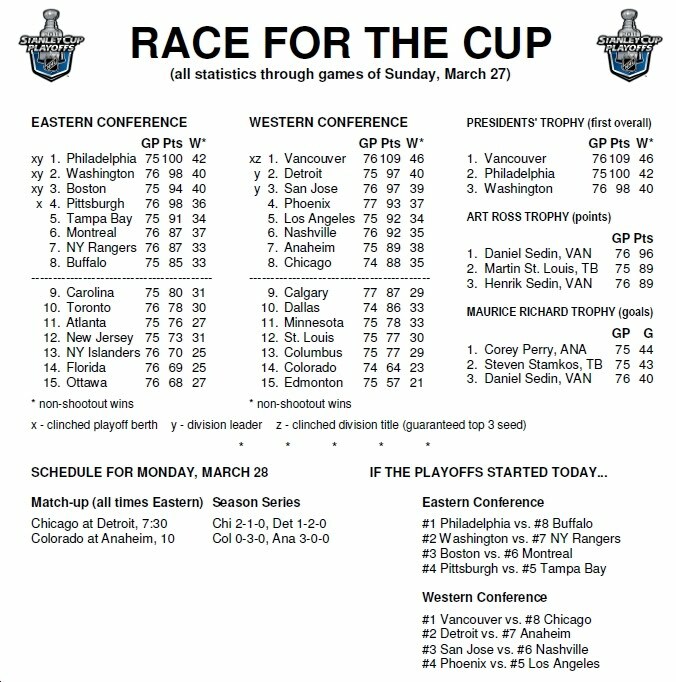 Atlanta at Montreal (6:30) The Habs are trying to hold off the Rangers for the sixth spot in the East while the Thrashers are close to mathematical elimination. Ottawa at Tampa Bay (6:30) The Lightning need to right their ship against the hard charging Senators. 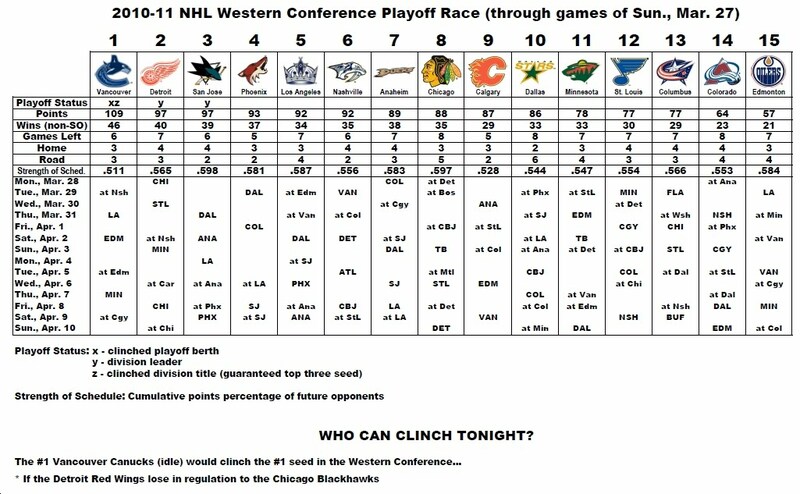 Minnesota st St Louis (7:00) It's a battle for eleventh place and both teams could be eliminated if Chicago wins in Boston. Vancouver at Nashville (7:00) This is the game of the night in the West with the conference's two hottest teams facing off in Music City (Canucks 9-1, Preds 8-1-1). Los Angeles at Edmonton (8:30) The injury decimated Kings are 7-1-2 in their last ten and hope to take advantage of the Oilers who have been horrible lately (1-6-3). Dallas at Phoenix (9:00) This is the second game on the tenth place Stars' murderers row five game road swing that finishes a swing through the rest of the Pacific after tonight. The Yotes are wanting to hold on to fourth for first round home ice advantage. The Nashville Predators (41-25-10) are looking for their seventh win in a row tonight at the Bridgestone Arena when the President's Trophy leading Vancouver Canucks (50-17-9) visit Music City. Vancouver is 11-2 in March and the Preds are 9-2-2. The Predators are 22-8-7 at home this season and are 8-1 in their last home games. The Canucks play as well on the road as they do at home with 25 wins at home and 25 on the road. The Canucks and Predators have met three times this season with the Preds winning twice. Last month in Nashville on February 17, the Predators played one of their best games of the year, besting the Canucks 3-1. On March 3, in Vancouver, Pekka Rinne shut out Vancouver 3-0. The Preds' lone loss came on the road on January 22 when two third period Canuck goals sunk the Preds 2-1. The Predators will continue to ride Pekka Rinne (30-20-8, 2.10, .929) who has started 36 of the Preds' last 40 games. He has held opponents to two goals or less in 24 of those starts. Since New Years Eve, he has 22 wins, a 1.94 goals against average, and a .936 save percentage. Cory Schneider (15-3-2, 2.16, .930) won against Columbus on Sunday so it is likely that Roberto Luongo (35-14-7, 2.18, .927) will be in net for the Canucks tonight. The two team are the top defensive teams in the league with Vancouver allowing opponents 2.24 goals per game while the Preds are at 2.30. A sideline to that statistic is the Jennings Trophy (goes to the goaltenders on the team allowing the fewest goals) race where Vancouver has allowed 170 goals and the Predators have allowed 175. Boston lies between the two at 173. After tonight's game, the Predators will travel to Colorado for a Thursday game with the Avalanche before returning home for a rare Saturday afternoon match against Detroit. Other previews come from Amanda DiPaolo, The Tennessean, HNIN, The Preditorial, Sam Page, and Fang Faction. Previews from Vancouver can be found at The Province, Vancouver Sun, Nucks Misconduct, Kurtenblog, The Canucks Way, and Canucks Hockey Blog. Slam Sports promises that tonight's game will be a smoozefest. Today's RLD Hockey Radio produced by Ryan Porth will feature an exclusive interview with Shane O'Brien and a live visit with Dan Rosen of NHL.com. Be sure and join us at noon Central on Blog Talk Radio or anytime on podcast. The Predators recent success is due to contributions throughout the line up according to Amanda DiPaolo. David Boclair points out that Patric Hornqvist has remained productive regardless of the situation that he is place in. Mike Fisher's leadership has been his key contribution with the Preds. The Province says that Shea Weber is the key to the Predators' future. They also have a feature on Pekka Rinne's run at the Vezina Trophy. In a third post, they have Shane O'Brien thinking a matchup with the Canucks in the playoffs would be interesting. Big news yesterday was J.P. Dumont accidentally hitting Barry Trotz in the head with a stick at practice. Sam Page has one of the most interesting posts that I've seen in a while covering a wide area of ground. HNIN looks at the role Mike Fisher has played in the rebirth of David Legwand. Jay Levin sets the Western Conference playoff picture at Predators.com. David Kalan at NHL.com has a feature story on the Predators being a force in the Western Conference. Patten Fuqua has the pre-game smack talk for Vancouver. Paul McCann lays out the final two weeks of the season for the Predators. Fans have the chance to vote on the top 10 Preds moments of the year. In the NBJ Brand Brackets, the Preds are taking on BMI, and the Bridgestone Arena is up against Hiller Plumbing and is getting drilled. Go to the links and vote early and vote often. Is Dan Hamhuis thinking about hanging them up after his fourth concussion? Bob McKenzie gives insight into Sidney Crosby's return. Jimmy Howard may return sooner than expected. Rumor on NHL Home Ice is that we will see him on Saturday in Nashville? Great mix of topics from Adrian Dater. Don't click if you aren't a fan of his writing. Ryan Miller was the NHL first star of the week, followed by Cory Perry and Henrik Lundqvist. 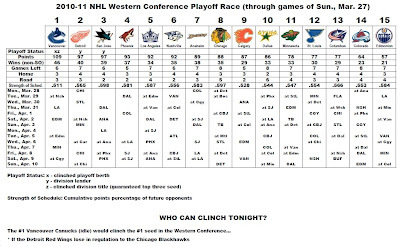 If the Flames win out and get to 97 points, they still lose the tiebreaker with every other team. Bob Wage makes it sound like the only thing to play for in Carolina is jobs for next year. T.J Oshie is in hot water in St. Louis for an unexcused absence. No one is saying much about it. Steve Lapore takes on the "loser point" at Versus. I can never get enough negative stuff about the three point games. Steve also grades Kovalchuk's first year in new Jersey. Mayor's Manor talked to Dustin Penner about his return to Edmonton tonight. After anointing Pekka Rinne as the best goalie in the west on Sunday, Kevin Allen does not list him in his list of Hart Trophy candidates. Joe Yerdon extracts the "Quote of the Year" from the Columbus Dispatch. Interesting perspective by Scott Arniel. John McCain is trying to turn up the heat on the Goldwater Institute and is having little success in helping with the Coyote's sale. The head of marketing for the Coyotes "resigned." I can't imagine a more unfulfilling job under the circumstance. Vintage Leaf Memories looks at Matt Sundin and whether he is hall of fame worthy. Big news with Dobber Hockey making sever acquisitions and changes. Go here to get the lowdown. Our friend Michael Langlois has a best of post with links to some of his more popular feature stories. If you have a Droid X, here is what the update to Gingerbread update will look like. Less that one half of one percent (20,000) of Twitter users produce 50% of the Tweets. I wonder how many Tweets you have to have to fall into that category. Not that I'll have time to watch but MLB Extra Innings will run a free preview from March 31-April 10. Tuesday Update: Pierre Lebrun reported on Twitter that there would be no hearing or supplemental discipline against Bertuzzi for his hit on Ryan Johnson. Just over five minutes into tonight's key Western Conference game between the Chicago Blackhawks and the Detroit Red Wings at Joe Louis Arena, Todd Bertuzzi laid a massive hit on Chicago's Ryan Johnson in the corner as he was passing the puck and received an elbowing major and a game misconduct. Once again the NHL's "wheel of justice" will probably take a spin with Colin Campbell's crew in Toronto tomorrow. With Bertuzzi's history of prior offenses it will be interesting to see the result. 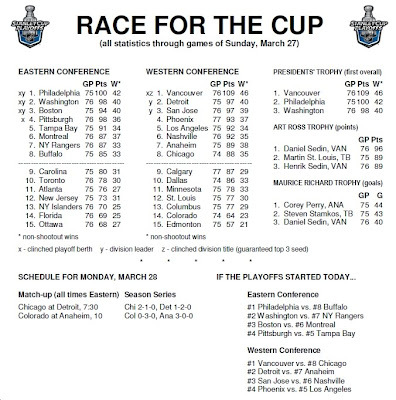 Here is Monday's updated version of Race for the Cup from NHL Media Services. 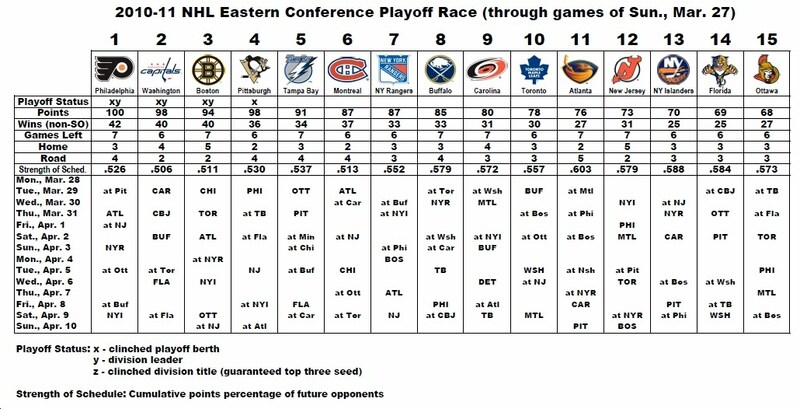 The East appears close to being set with the five point gap between Buffalo and Carolina looking large. Boston clinched a berth over the weekend. In the West, Vancouver can clinch the number one seed if Detroit loses in regulation tonight. The Wings-Blackhawks game is big for both teams with Detroit fighting for the number two seed and Central Division title and Chicago trying to secure their return to the playoffs. Click on the images below for a larger, readable/printable copy and more detail on the Pen's possibilities. 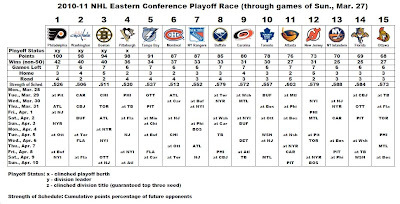 The weekend featured plenty of action and help sort out the playoff races, especially in the Eastern Conference where a five point gap developed between Buffalo and Carolina for the final playoff position. The Western Conference still has ten teams in play but Calgary's flame appears to be growing faint as they are quickly running out of games. Dallas faces a murderers' row, playing every other team in the Pacific Division on the road. I'm betting that the current top eight will be in the playoffs but I do expect plenty of shuffling for final position. With the Kings and Detroit facing injuries to key players, it will be interesting to see how they respond. That will start tonight for the Wings with Joey MacDonald in goal as they host the Blackhawks in the Versus/TSN game at 6:30 Central. In the late game, Anaheim will host Colorado in what should be another two points for the Ducks. So since there is little action tonight, here is every goal from the weekend courtesy of NHL on the Fly. After Thursday's 5-4 win over Anaheim, Coach Barry Trotz was as animated as he has ever been in showing his disappointment in spite of a victory. The Predators almost blew a 5-1 third period lead and the coach was not happy. Forty-eight hours later, things appeared to have been put in a more even perspective by the players and the coach. After Saturdays, huge 4-2 win over Dallas I asked several player and Trotz what effect the lessons learned in the prior game had on the team's performance. Pekka Rinne had a positive response, "It almost felt like for a bit that we had won the game against Anaheim but it left a bitter taste in your mouth and you don't want to finish a game like that. We talked about it and coach talked about it and I think we were much better prepared tonight." Ryan Suter said, "He (Trotz) didn't say much, it was more we knew we didn't play well and everyone says he ripped you guys. For us we knew we let them get too close and we knew we made mistakes. I think it was more us realizing." David Legwand downplayed the incident, "It was good. I don't know if he (Trotz) was too upset. He might have been a little disappointed but I think if that happens again, something that doesn't happen too often in a guys career, a chance to get a hat trick. We tried to feed him, it was still a two goal lead. When it was a one goal lead, we hunkered down and they didn't get the zone for the last 35 seconds so it was something we tried to do for Sergei and it's over and done with. Barry Trotz explained his view on the response, "We're getting close to going where we want to go, the post season. You want to make sure you are detailed. You want to make sure that you learn that lesson. You want to make sure that it doesn't happen again, and you want to make sure every second, every inch, every play could be the difference in winning and losing and play with that detail and focus and also play with that composure that you need to play in that situation and tonight that was a good response to the way we played the other night in the third." In the end, it appears that the Predators were able to get two points on Thursday, regroup, and apply what the learned from the experience and produce a critical win against Dallas on Saturday. The Predators' next game will be tomorrow night against the President's Trophy leading Vancouver Canucks at the Bridgestone Arena at 7 p.m. Hopefully, the lessons learned last week will continue to show dividends. Here is our game story from Saturday night with postgame video. Jim Diamond touches on the Stars' fluke goal. From the blog world reports come from Amanda DiPaolo, Mark Willoughby, Dirk Hoag (with his advanced stats), Jeremy Gover, Paul McCann, Predatorial, Fang Factions, Fang Finger Fever, and Hockey Night in Nashville. The other side of the story can be found at The Dallas Morning News, ESPN Dallas, the Star-Telegram, The Dallas Stars Blog, and Defending Big D.
Audio clips from the Predators include Mike Fisher, Patric Hornqvist, Ryan Suter, and Pekka Rinne. Clips from the Dallas dressing room include Coach Marc Crawford, Brad Richards, and Brendan Morrow. Amanda DiPaolo spills the beans on Mike Fisher's health and the productive path that lays ahead. David Boclair makes the case that the last two came were the biggest of the season. Kevin Allen thinks that this may be the year for the Predators in the playoffs and thinks Pekka Rinne is the best goalie in the Western Conference. Mark Willoughby has a thoughtful piece on Passion or Poison and looks at some of the bitterness in rivalries and what is driving it. Robby at HNIN looks at concussions and how prevalent they have been this season. The Milwaukee Admirals lost 3-2 in overtime on Saturday in Atte Engren's North American debut. Last night, the Ads cut their magic number to two with a 2-1 win over San Antonio. With Sunday's win, the Admirals became the first team in AHL history to have 40 wins and 90 points in eight consecutive seasons. Vanderbilt won the inaugural I-40 faceoff on Saturday 6-2 as each tram took a different approach to the game. It was a horrible weekend for the Los Angeles Kings with Anze Kopitar going down with a broken ankle and the Red Wings got a scare when Jimmy Howard had to leave the ice on Saturday. Dan Hamhuis had to leave the Canucks game with Columbus yesterday with what is being reported as another concussion. It is too bad that he will miss another game against the Preds on Tuesday. Ryan Porth met up with Alex Goligoski on Saturday and talked about his experience in Dallas. Andre Delsol went over the hump yesterday on his 30 cities in 29 days. His post about Tampa and the challenges on the trip is really interesting. Patrick Hoffman has a tale of two seasons for Craig Anderson who gave up some hard luck goals in Atlanta yesterday in Ottawa's 5-4 shoot out loss. Over the weekend I found a new Twitter account called @NHLMedia that has several lists broken down by conference featuring the best of NHL MSM and Blog Twitter accounts. This would be a good starting place for a fan new to Twitter looking for folks to follow. Ken Campbell looks at Jordan Subban and wonders if he will eventually be better than his older brother P.K. According to a report, it appears that Marc Savard's concussion problems have gotten worse. The New York Times has the most complete expose on Festival Tennessee with supporting documentation put together in one place to date. ESPN has a nice feature on the worlds greatest surfer, Kelly Slater. Here is a list of 15 places to travel with your kids before they are 15. The Return of "History Will Be Made"